GomSpace Sweden, a subsidiary of GomSpace Group AB, has received an order from Astrocast to deliver a propulsion system for each of the 10 nanosatellites composing the first orbital plane of the new Astrocast constellation — the value of this order is 450.000 euros and delivery of the propulsion systems is expected to occur in Q4, 2018, and Q1, 2019. 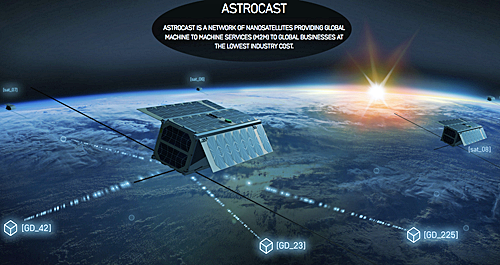 Astrocast a pioneer in deploying smallsats to create a global Internet of Things (IoT) network. This will be the first propulsion system operating on a constellation of 3U cubesats. This contract is a follow-on order after delivery of propulsion systems for the two precursor satellites that will be launched this fall. The system will allow Astrocast to ensure a more rapid deployment of each satellite in its intended position as well as collision avoidance maneuvers. The propulsion system for Astrocast is based on GomSpace Sweden's cold gas propulsion technology with flight heritage from both 3U and 6U cubesats. The latest launch of a satellite with this propulsion system was February 2 of this year. In this mission, the GOMX-4B satellite together with its twin, GOMX-4A, have already demonstrated the kind of orbit control that Astrocast is planning.